I have a weakness for “Western” style burgers. Anyone who really knows me would agree. Hardee’s looks to entice me enough to drive an hour to get one. Introducing the Western Bacon Thickburger from Hardee’s. Thanks to GrubGrade reader Max for making me aware of this burger. We might be seeing his impressions of this delicious looking burger in the near future. A Charbroiled, 100% Black Angus Beef Patty, Two Strips of Bacon, Pepperjack Cheese, Garlic-Pepper Onion Straws, Lettuce, Tomato Slices and Kentucky Bourbon Glaze. The “Single” ($2.99) version is shown above but if you can handle it, go for the “Double” ($3.99) or the Six Dollar Kentucky Bourbon Burger ($4.89). This burger is sure to satisfy what ever level of hunger you bring. Available for a limited time. **Get your $1.00 off coupon here. Whenever I visit Dunkin Donuts, I usually just stick with my standard sausage, egg, and cheese on a croissant or maybe go with a bagel and cream cheese. The newer items haven’t really lived up to my expectations. I recently decided to risk my breakfast once again on something new. Introducing the Waffle Breakfast Sandwich from Dunkin Donuts. When I first heard about the waffle sandwich I figured it was just Dunkin Donuts’ version of the McGriddle from McDonald’s, which happens to be one of my favorite breakfast sandwiches. According to their press release, the new item is an ’oven-toasted sandwich featuring cherrywood smoked bacon, scrambled eggs, and American cheese between two maple-infused waffles’. So instead of pancake patties, you’re getting waffles. I had to find out if this sandwich could top the McGriddle. I have to say this was a sandwich I was very happy to have tried twice. The first time I had it, I barely tasted anything but the waffles. The bacon, egg, and cheese were hidden in the background and when I even tried smelling the sandwich the scent of bacon wasn’t very strong. I feel like this was the fault of the particular store I visited since the service was off, it was quite late, and the second store I visited made the sandwich how I thought it should be made. When I took the sandwich out of the wrapper, I noticed that there was much more bacon, and the scent of bacon was quite strong. Dunkin Donuts now has cherrywood smoked bacon, although it tastes like your standard bacon to me. If they didn’t have signs up throughout the store telling me they were using a different kind of bacon, I would have never noticed. The bacon was crispy in some parts and chewy in others. The waffles are only ‘true’ waffles on one side with the inside of it flat with no grooves. The waffles aren’t as greasy as the McGriddle pancakes. 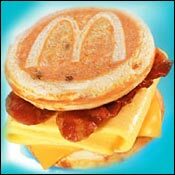 I’d also give the edge to the McGriddle in the sweetness department. The maple syrup flavor is noticeable, but it isn’t as strong as the McGriddle. Most of the maple flavor is found in the little nuggets of maple in the waffles. On certain bites, the flavor of the egg and the cheese was lost to the flavor of the bacon and waffles. It was only a few times that all the ingredients came together nicely. Maybe if I hadn’t been comparing this breakfast sandwich to the McGriddle the entire time, I would have thought better of it. It’s kind of hard not to compare it to the McGriddle, however, since they are so similar. Their press release states it will be available through March 17th, so you’ve got about a week left. I will continue to purchase my sausage, egg, and cheese on a croissant, but I’m glad to have tried this sandwich. It didn’t live up to the McGriddle, but it’s worth trying. Pros– Not as greasy as the McDonald’s McGriddle. Subtle sweetness of maple syrup. Cons– May suffer from inconsistency between visits. Not as satisfying as the McGriddle from McDonald’s. Conflict with Egg/Cheese vs Waffle/Bacon taste.